Find your rustic loft retreat perched aloft Bryson City - the Basecamp for Outdoor Adventure - in the Great Smoky Mountains of Western North Carolina. Whether you decide to drift away on the southern comfort of our sleepy little town or soar away on your Basecamp. For Outdoor Adventure, there is something for everyone. Conveniently located downtown, take a stroll to many of our town’s boutiques and restaurants or rent a bike and pedal to Deep Creek for tubing, hiking, and horseback riding. 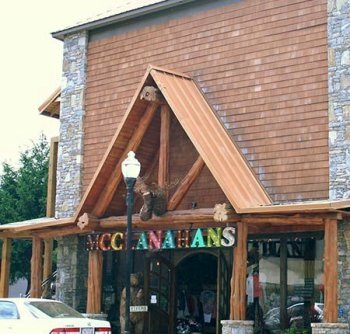 Within just a few minutes’ drive you will find artisan baskets at The Cherokee Indian Reservation, World Series of Poker Allstars at Harrah’s Casino, and the Freestyle Kayaking World Championships at Nantahala Outdoor Center. Men’s Journal magazine ranked Bryson City as one of the “Top Ten Best Summer Mountain Towns” and Southern Living picked The Great Smoky Mountains National Park as one of its number one weekend getaways and Bryson City as the place to stay and dine while visiting the park. From rocking chairs and porch swings to whitewater rafting and scenic train adventures, we hope you will stay with us to create your mountain memories.